Sunset View and 'a charming apartment in a historic building of the twelfth century. The house covers about 125 square meters, offers two double comfortable bed, a large bathroom, the long corridor that links day from sleeping area, laundry room, kitchen and living room. The central location in the Piazza San Marcellino, UNESCO heritage, guarantees a unique experience to visitors. Literally a stone's throw from the aquarium allows you to easily reach on foot all major attractions (Via Garibaldi 3-minute walk). The spaces of the house are spacious, bright and furnished with everything needed for a short or long stay. The lounge offers a breathtaking view of the harbor, with three doors that allow you to enjoy the sunsets among the best in town. The kitchen and 'habitable and furnished with everything you need for even the most experienced cooks. The corridor leads to the sleeping area where you will meet a large bathroom and finally the two bedrooms. The well appointed rooms are in a quiet area from where you can admire the bell tower of the church of San Marcellino directly from the bed. Both rooms are furnished with kind size beds. Choose us will allow you to live a unique experience in the historic Genova where art, history, food and wine are woven into the great wealth Medieval paths. 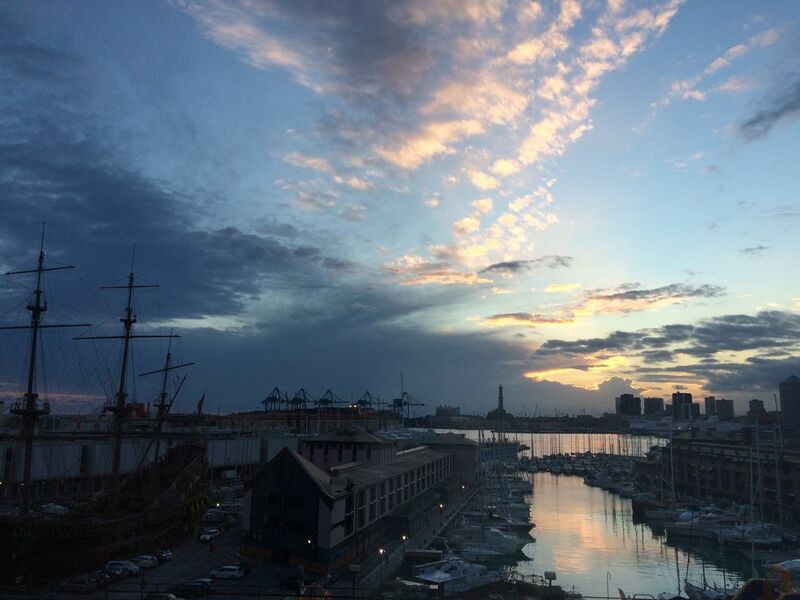 Genova ancient center of trade in the Mediterranean and 'always been an important port. The magnificent antiquities continues to maintain its splendor in palaces and streets. It remains a port where history, trade, immigration, shipbuilding from Yatch and movement are the 'essence. L 'cosmopolitan imprint can be seen at first glance, where historic buildings we leave place to Muslim butchers, support bar as a cable that has existed for over a century. Great location, stunning views, warm and comfortable atmosphere, we loved it! Host very helpful and accommodating, hope to return. Accueil très chaleureux, appartement très bien situé, et très agréable, avec une vue tous les jours étonnante sur le port et la ville. We really loved our stay in Genova and in the beautiful appartment (eames chair, mies van der rohe sofas) of Jacopo who is very nice and helpful! The view over the harbour from the living room is gorgeous! Fortunatly we had really good weather ans so had a great sunset every evening! Obviously it is not calm, because the building is in the middle of the city but the sleeping room is in the back of the appartment and very calm. We slept very well there! You step out of the appartment and you are in the old town of Genova which is really etraordinary, a bit like an afro-arabian bazar but also with a lot of trattorias, little shops with clothes, shoes and so on. On the opposite site you have the old harbour with the wonderful aquario! Grazie mille! Quite an objective and very nice review. Loving it! Thank you very much - Grazie mille!